The building in Dublin city centre has been taken over by homelessness activists. 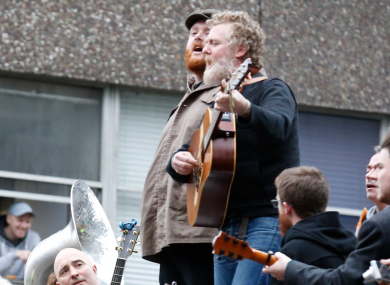 GLEN HANSARD WAS joined by Hozier, Chris Dignam, Kodaline, and others for an impromptu performance at Apollo House. The building in Dublin city centre has been taken over by activists Home Sweet Home and re-purposed as a homeless hostel. The receivers to Apollo House have launched a High Court action aimed at regaining possession of the property. Volunteers working to kit-out the disused building say they have been overwhelmed with support from the public, and intend to maintain their presence at the site to draw attention to the problem of homelessness. Around 30 people are now staying in the former Department of Social Protection Building near Tara Street Dart station each night, according to Home Sweet Home organiser and union activist Brendan Ogle. Email “Apollo House Occupation: Hozier, Glen Hansard and friends perform live at Dublin homeless hostel ”. Feedback on “Apollo House Occupation: Hozier, Glen Hansard and friends perform live at Dublin homeless hostel ”.